Alessandro Scarlatti was one of the leading composers in Italy in the decades around 1700. His reputation was founded on his operas, serenatas, oratorios, liturgical works and especially his chamber cantatas. It is notable that he almost exclusively confined himself to vocal music and composed hardly any instrumental works. Why did he turn to the genre of the concerto at a relatively old age? He was 50 when he started the composition of these Sinfonie di concerto grosso in 1715. That title is not quite correct. It is only the first concerto which uses the words concerto grosso, whereas the second is called Sinfonia Concertata Con li ripieni. The other concertos have no titles at all. Eight of them are in fact solo concertos for recorder. Only the remaining four can be considered concerti grossi as they include two solo parts, for recorder and either a second recorder (Nos. 1 and 5), an oboe (No. 4) or a trumpet (No. 2). Every concerto in the set has a separate cello part which is distinct from the basso continuo part. The separate parts are collected under the title 12 Sinfonias and Concertos. That could give us a clue as to the reasons why Scarlatti started to compose them. Several composers of the time published collections under such a title, and as domestic music-making was becoming increasingly popular he may have seen an opportunity to raise his income. Unfortunately they were never published. They have been preserved in two manuscripts which are now in the British Library. Was it Scarlatti's intention to have them published in London? Quite possible, because Italian music was very popular in England, and so was the recorder. This could have been the reason he gave this instrument such an important role, especially considering that he didn't like wind instruments which he said were unbearably out of tune. These concertos are in five movements: fast - slow - fast - slow - fast. The exceptions are No. 4 which omits the opening fast movement and No. 9 the last movement of which is followed by a menuet. These are not solo concertos of the kind we know from Vivaldi. Scarlatti didn't adhere to the ritornello form. The solo part is fully integrated into the ensemble. It is especially in the slow movements that the recorder - in four concertos joined by the second solo instrument - has the opportunity to shine. Although Scarlatti was a seasoned composer of music for the theatre there are few dramatic features in these concertos. Alessandro Lattanzi, in his liner-notes, sees some similarity between the opening and closing movements and the opera sinfonias. The recorder parts are not virtuosic; that seems to confirm that Scarlatti had the amateur market in mind while composing these concertos. The concertos featured here are not that well known. I am aware of only one complete recording: by the Accademia della Magnifica Comunità (Tactus, 2002/2007; two separate discs). The performances are good, but they perform the tutti with one instrument per part. However, two concertos include indications of a distinction between soli and tutti or of ripieni which seems to point in the direction of performance with a larger ensemble. Some years ago Corina Marti and the Capella Tiberina delighted us with the complete recording of the twelve recorder concertos by Francesco Mancini, another Neapolitan composer of a later generation (review). This new production is just as enjoyable as the Mancini set. Ms Marti is a very fine player and the ensemble acts on the same level. 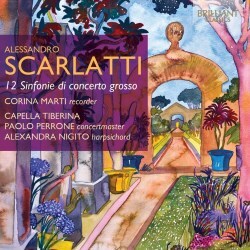 This recording makes one regret that Scarlatti didn't compose much more for instrumental ensemble.